Our mission is empowering Iowa's communities and school districts to make more environmental, energy efficient decisions and improvements through direct service work, environmental education, professional development opportunities, and volunteer engagement. Green Iowa AmeriCorps operates through the University of Northern Iowa’s Center for Energy and Environmental Education (UNI CEEE) in Cedar Falls looking to recruit passionate and motivated individuals for an 11 month service experience in one of our service locations throughout Iowa. As a member of our new and existing programs sites, you will have the opportunity to create plans in conjunction with city officials, nonprofit leaders, school districts, and execute projects that will greatly impact the communities we serve. The leadership and empowerment experienced as part of our program will be like no other! 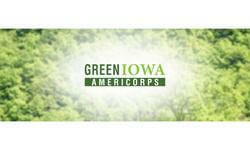 Green Iowa AmeriCorps consists of three branches: Energy & Community, Sustainable Schools and Land & Water Stewards. Each branch of our program will provide AmeriCorps members with the unique opportunity to enhance their professional development goals, cultivate community-wide relationships, and work toward making Iowa a more sustainable, eco-nomic state. +Land & Water Stewards-members create environmental education and community programming related to healthy water and land stewardship in conjunction with many local and state partners throughout Iowa. Each of Green Iowa AmeriCorps locations offers unique service opportunities that allow members to provide service in partnership with city initiatives, universities, cutting edge nonprofits and impactful community action agencies. Service with Green Iowa AmeriCorps is a year like no other, providing you an opportunity to make a difference in peoples’ lives on a daily basis all while gaining work experience that is going to put you leaps and bounds ahead of your peers in the energy and environmental sector. Green Iowa AmeriCorps uses teams of highly trained and passionate corps members to complete projects related to energy conservation, environmental education, and service projects and events that provide communities an opportunity to engage in their environment. Nearly 1,000 residential energy efficiency projects a year, including energy audits and follow-up weatherization services. Residential services target those in most need of energy efficiency services including residents who are low-income, older persons, individuals with disabilities and Veterans. Members also work with school districts to reduce energy and waste costs while instilling behavior change practices through the school district. The direct service work of the program is coupled with a variety of educational programming for all ages. Members provide 300 programs a year related to energy efficiency, sustainability, waste reduction, renewable energy and environmental awareness. The program also looks to leverage volunteers to magnify the impact of service in each community. Green Iowa AmeriCorps generates nearly 1,400 volunteers annually and completes 100 community service projects in collaboration with community partners, colleges, churches, and civic organizations. The goal of the program is not only to create long term benefits for the communities and individuals served but to provide a highly satisfying, enriching member experience for its members.